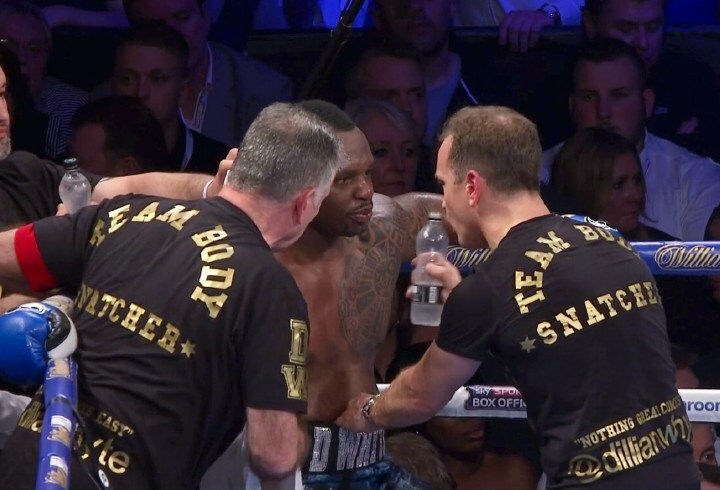 In a great, great heavyweight slugfest that exceeded all the hype, Dillian Whyte closely out-pointed bitter rival Dereck Chisora via 12-round split decision tonight in Manchester. These two went AT IT from the first bell to the last and we have not seen heavyweight action like it in a long time. Eventually, after too many switches of momentum to keep up with, younger man Whyte edged the thriller via scores of 115-113 and 115-114. The third judge had it 115-114 for Chisora. Tonight’s epic, one that left both men exhausted, was simply too close to call, and as many fans that felt Chisora won were matched by fight fans who felt Whyte deserved the victory. Every round was exciting, with a couple, at least, being Round of The Year material – the 5th being an especially torrid session. At times it looked as though Chisora was on the verge of stopping his man, only for Whyte to come back and turn the tables. Later on in the war, both men were just too tired to land the finishing shot. Both Londoners bled from the mouth and dug deeper than never before. Still, after all the bad blood, the two DID embrace at the end of their awesome battle. These two earned the respect of one another and fans witnessed something special. You are here: Home / Boxing News / Dereck Chisora and Dillian Whyte give us a Fight of The Year candidate!